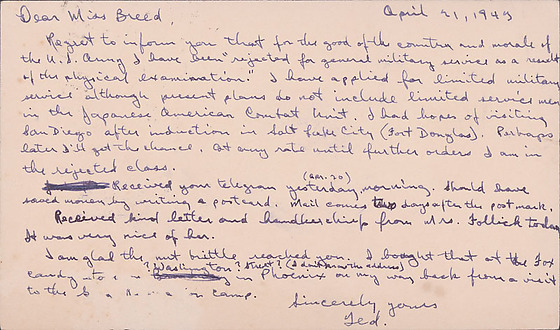 April 21, 1943/Dear Miss Breed,/Regret to inform you that for the good of the country and morale of the U.S. Army I have been "rejected for general military service as a result of the physical examination." I have applied for limited military service although present plans do not include limited service men in the Japanese American Combat Unit. I had hopes of visiting San Diego after induction in Salt Lake City (Fort Douglas). Perhaps later I'll get the chance. At any rate until further orders I am in the rejected class./Received your telegram yesterday (Apr. 20) morning. Should have saved money by writing a postcard. Mail comes two days after the post mark. Received kind letter and handkerchief from Mrs. Follick today. It was very nice of her./I am glad the nut brittle reached you. I bought that at the Fox candy store on ?Washington?Street? 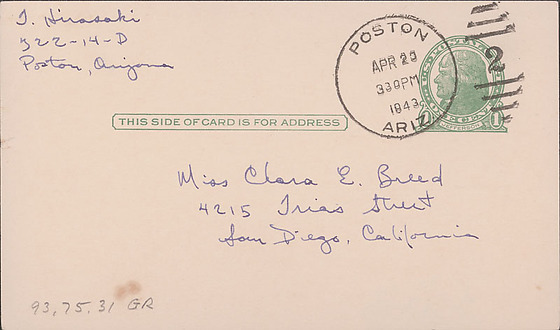 (I don't know the address) in Phoenix on my way back from a visit to the Gila Relocation Camp./Sincerely yours/Ted.